At MetalReviews we try to keep track and update you when one of the metal musicians passes away. I know I had to post a number of sad news bits in the past and follow them up often with a review to commemorate a fallen metal comrade. Usually, people respond with RIP wishes, so it surprised me the news of Riot guitarist Mark Reale’s passing garnered no such comments. What better way then to honor the man but to review Riot’s recent (and now possibly final) album Immortal Soul? Even though Riot has been in existence since the late 70s, where I come from the band was never that popular. Perhaps that has something to do with Riot being an American act, struggling with both peer recognition and commercial success, almost throughout their existence. By the time the band released a pair of their signature albums, Thundersteel and The Privilege of Power, with vocalist Tony Moore as a frontman, I was past my high school metal-gobbling days so even those hits largely went by me. I remember hearing those albums in passing, and that’s about it. Moving on to the US a few years later there was so much metal to catch up on, Riot still did not make my radar. 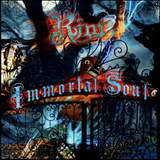 In a way then, Immortal Soul is a very late, yet fresh, introduction to Riot on my part. I need to balance then the fairness in my review with an outright respect for the deceased author. Having listened to Immortal Soul now many a times, however, unless you are truly prejudiced against some quality, commercial sounding, spotlessly produced heavy metal, it is impossible not to be impressed with the album as a whole. Just like it is probably the case with many classic metal albums, Immortal Soul can be deciphered and appreciated as a sum of its standalone individual tracks, and by far, the good ones outweigh those below par. The first half of Immortal Soul tends to be where the better tracks are located. Empowering pair of openers Riot and Still Your Man sweeps up the listener into the vortex from the hop with their non-stop fluid guitar movement. Bordering on frenetic sometimes, guitar fluidity on Immortal Soul is remarkable and is truly a tribute to Mark Reale’s and Mike Flyntz’s guitar skills. Leads and solos on every track are standout and confirm that hours of practice and years in this business is what it takes to sound so smooth and powerful at the same time. Still Your Man makes a play on Riot’s earlier hit Johnny’s Back from Thundersteel and Wings are for Angels is another speed metal track showcasing the band’s mettle. Tony Moore is back to handle the vocals on Immortal Soul, and given that I would struggle to reference how well he was hitting high notes 20 years ago, he is definitely trying here to touch on all sort of registers. He makes the mark in Riot, but does come off overextended in Insanity and Believe, not making the best of the song’s material. The second half of the album doesn’t bite as much. Sins of the Father is a little silly and glammy despite a hooky refrain. Majestica is a short cinematic instrumental interlude in bad need of further continuation and development, but Whiskey Man is catchy as hell and closer Echoes is epic without sounding overly modernized in a Rhapsody sort of way. With a couple of tracks where the tempo is slowed down (Crawling, Fall Before Me), Riot inserts strategic breaks into the album flow. The Egyptian theme in Crawling is a little overused, but the bridge, chorus and bluesy middle completely won me over. Fall Before Me has that darker prog feel of Evergrey and Tad Morose where they mute the guitars and let the background swell to the fore. The chorus melody is a total winner, the hook sinking in deep. I understand that Mark Reale struggled with his health as the album was being recorded. The man should be proud of the legacy he left behind, Immortal Soul being a fitting and strong swan song.